Use one: See from hence, that there is nothing within us that could justify, but something without us; not any righteousness inherent, but imputed. We may as well look for a star in the earth as for justification in our own righteousness. The Papists say we are justified by works; but the apostle confutes it, for he says, “not of works, lest any man should boast.” Eph ii 9. The Papists say, “the works done by an unregenerate man indeed cannot justify him, but works done by a regenerate man may justify.” This is most false, as may be proved both by example and reason. (1) By example. Abraham was a regenerate man; but Abraham was not justified by works, but by faith. Abraham “believed God, and it was counted to him for righteousness.” Rom 4:3. (2) By reason. How can those works justify us which defile us? Our righteousnesses are as filthy rags. Isa 64:6.…good works are not an usher to go before justification, but a handmaid to follow it. (2.) Labour for this high privilege of justification. There is balm in Gilead; Christ has laid down his blood as the price of our justification and he offers himself and all his merits to us, to justify; he invites us to come to him; he has promised to give his Spirit, to enable us to do what is required. Why then, sinners, will ye not look after this great privilege of justification? Why starve in the midst of plenty? Why perish when there is a remedy to save you? Would not he be thought to be distracted, who having a pardon offered him, only upon the acknowledgment of his fault, and promising amendment, should bid the prince keep his pardon to himself; for his part, he was in love with his chains and fetters and would die? Thou who neglectest justification offered thee freely by Christ in the gospel art this infatuated person. Is the love of Christ to be slighted? Is thy soul, is heaven worth nothing? Oh then look after justification through Christ’s blood! Consider (i) The necessity of being justified. If we are not justified, we cannot be glorified. “Whom he justified, them he also glorified.” Rom 8:30. 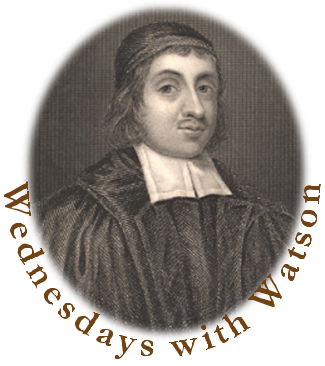 He who is outlawed, and all his goods confiscated, must be brought into favour with his prince before he can be restored to his former rights and liberties; so, we must have our sins forgiven, and be brought into God’s favour by justification, before we can be restored to the liberty of the sons of God, and have a right to that happiness we forfeited in Adam. (ii) The utility and benefit. By justification we enjoy peace in our conscience; a richer jewel than any prince wears in his crown. “Being justified by faith, we have peace with God.” Rom 5:1. Peace can sweeten all our afflictions, it turns our water into wine. How happy is a justified person who has the power of God to guard him, and the peace of God to comfort him! Peace flowing from justification is an antidote against the fear of death and hell. “It is God that justifieth, who is he that condemneth?” Rom 8:33, 34. Therefore labour for this justification by Christ. This privilege is obtained by believing in Christ. “By him all that believe are justified.” Acts 13:39. “Whom God hath set forth to be a propitiation through faith in his blood.” Rom 3:25. Faith unites us to Christ; and having union with his person we partake of his merits, and the glorious salvation which comes by him. Use three: Comfort to the justified. (1) It is comfort in case of failings. Alas! How defective are the godly! They come short in every duty; but through believers should be humbled under their defects, they should not despond. They are not to be justified by their duties or graces, but by the righteousness of Christ. Their duties are mixed with sin, but that righteousness which justifies them s a perfect righteousness.